• Findings are known to be in the direction of lowering blood fat pulp / is a food rich in fiber. • Carbohydrates high value, protein value is low. • Vitamin B1 in Bulgur, plays an important role in the nervous and digestive systems. • Has saturated fat and total fat is a healthy food because it is low. • The biggest disadvantage of phytic acid in cereal products, bulgur because of cooking and drying process, are not found in wheat. • speeds up the absorption of nutrients due to the high mineral and cellulose, prevents constipation and prevent colon cancer. • The most important source of food availability around the world come to when mixed with legumes. • It does not absorb radiation and is resistant to radiation. Therefore, against nuclear war in some countries, the products held in stock for military and civilian purposes. • During the cooking process the nutrients contained in the germ portion of the grain grain nutrients penetrate into other products (bread, pasta) are higher. • For cooking and drying, is resistant to mold and shelf life is longer than other products. Bulgur wheat Benefits include relatively high amounts of fiber has brought a significant position in the intestines work. Also has a full-retaining properties of the fibers has an important role in load bulgur weight control. 25-30 grams per day, as specified by the World Health Organisation. There are around our fiber needs. Vitamin B1 in the building; It plays an important role in strengthening our nervous and digestive system. Moreover, this vitamin is necessary to regularly consumed in the prevention of disease beriberi. Results will boost the level of intelligence of infants and pregnant mother of folic acid contained in the structure except through them all, which is very necessary. 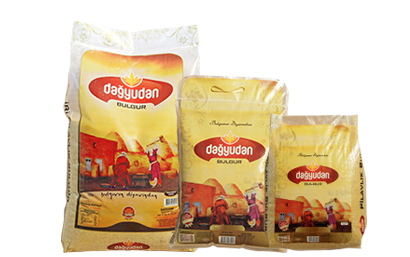 Due to the low glycemic index, bulgur, wheat long full amount in the blood is a product that can be used in slow-mixed diet. It is also recommended to the diabetics. Also the salads, a product offering highly variable due to a material used in hot and cold food.